The Rebel Sweetheart. : Foodie Goodie | Salmon Rice Bowl. Lent officially began two days ago (March 5), on Ash Wednesday. For Catholics, this means forty days of penance which includes abstinence from eating meat on Fridays during that period. And with that, my no-meat Friday begins today, with this fish dish that we'll be having for lunch. 1. Using a mortar, pound the ginger with the sugar, chili, and chopped garlic to a coarse paste. 2. Transfer the paste to a bowl, stir in with 1/4 cup of water, lime juice, and fish sauce. Add the cucumber. 4. Heat the oil in a non-stick pan. Add the salmon to the skillet and cook over moderately high heat until lightly browned, about 3 minutes. 5. Turn the salmon and cook over moderate heat until opaque throughout, about 4 minutes. 6. Mound the rice in bowls. 7. 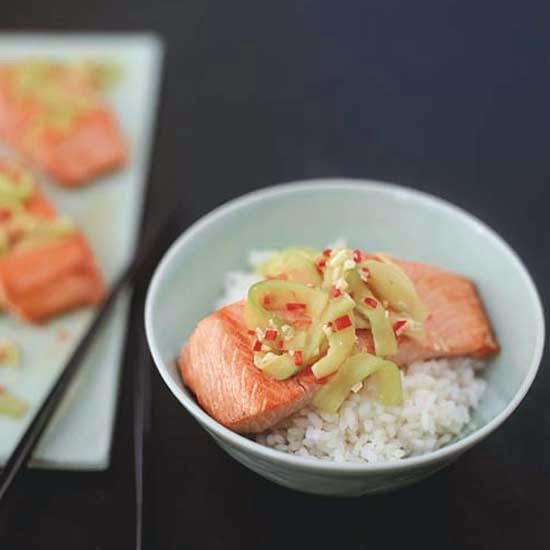 Top with the salmon, garlic cloves and ginger-lime sauce with cucumber strips and serve. As seen on Food and Wine. Shared with Food Friday and Food Trip Friday. I am actually thinking of fish recipes that I'll prepare for my family. I hope I can cook this recipe of yours too. My husband loves salmon. Thanks for sharing this. Do you buy the salmon already skinned or are you the one who takes the skin off? Love this! I recently cooked panfried salmon with cream cheese naman :) This looks good! This is so easy and healthy and of course delicious. I would like to add kimchi on that bowl of rice too. Great idea. I make a lot of salmon, this would be a good change. I just had salmon yesterday but this one looks yummier! I forgot to ask. I don't have fish sauce but I have oyster sauce. Do you know if that would be a good substitute? been ages since i cooked salmon! that looks delicious!